My, How His Garden Grows! 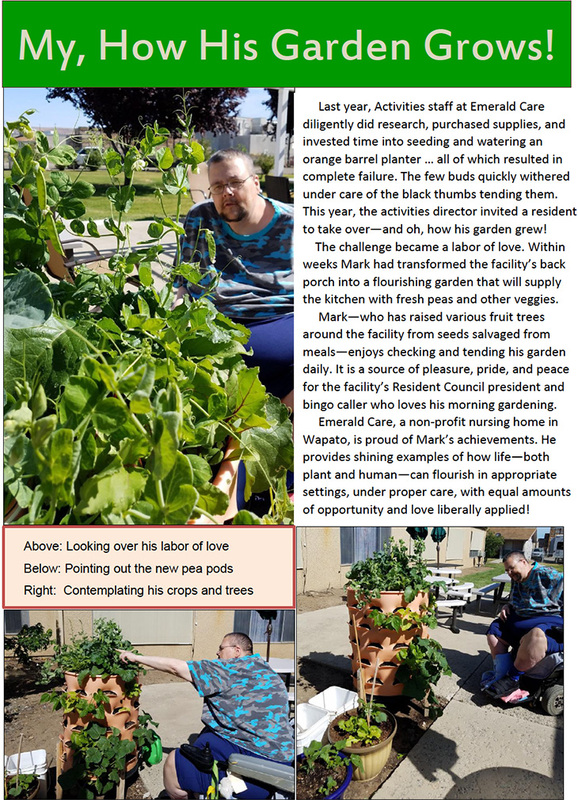 Last year, Activities staff at Emerald Care diligently did research, purchased supplies, and invested time into seeding and watering an orange barrel planter … all of which resulted in complete failure. The few buds quickly withered under care of the black thumbs tending them. This year, the activities director invited a resident to take over—and oh, how his garden grew! The challenge became a labor of love. Within weeks Mark had transformed the facility’s back porch into a flourishing garden that will supply the kitchen with fresh peas and other veggies. Mark—who has raised various fruit trees around the facility from seeds salvaged from meals—enjoys checking and tending his garden daily. It is a source of pleasure, pride, and peace for the facility’s Resident Council president and bingo caller who loves his morning gardening. Emerald Care, a non-profit nursing home in Wapato, is proud of Mark’s achievements. He provides shining examples of how life—both plant and human—can flourish in appropriate settings, under proper care, with equal amounts of opportunity and love liberally applied! It was a wonderful Mother’s Day for all! It was a wonderful Mother’s Day for all, as described in the attached article that appeared in the May 2018 Review-Independent newspaper. To enjoy more photos from the facility’s celebration, click here. 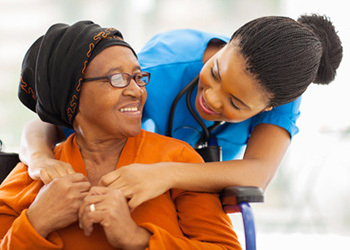 Emerald Care is getting a $1 million facelift! Start and finish your Christmas shopping and load up on fantastic edibles while you’re here! We had a Boo-tiful afternoon! What a BOO-tiful afternoon we had at Emerald Care on Tuesday, Oct. 31st, celebrating Halloween together with lots of fun costumes, shared laughter, spooky music, and delicious goodies to eat & drink! Be sure to check out all the pictures in our Photo Gallery! Emerald Care residents are tackling childhood cancer!